Despite Egypt’s economic woes, new restaurants in Cairo continue to sprout. The Greek, a small nook of an eatery right next to La Rosa on Road 231 in Degla, comes as a pleasant alternative to the recurring food trends across the city. The restaurant is the brainchild of three partners and friends, one of whom takes care of things at the front of the restaurant, while another is in charge around the open kitchen. A simple exterior, that encompasses a small smoking area, is decorated in a simple – and appropriate – blue and white colour scheme. The inside is clean and organised, made warm with rustic brick wall detailing and personalised art – the bathroom being a particular beneficiary of this. There isn’t much seating, with only five tables available, so reservations are highly recommended. The menu – under the direction of one of the owners’ Greek mother – is filled with staple Greek dishes including souvlaki, gyros and all sorts of appetisers, including fried calamari (28LE), tzatziki (9LE) and a classic Greek salad (33LE). Both the calamari and the tzatziki – a yoghurt, garlic and cucumber dip – were good accompaniments to the salad, which was a perfect concoction of flavours and tartness, along with an excellent feta cheese, although the cucumbers in particular could have been fresher. The fried kefalotiri cheese (30LE), however, was one of the standout dishes; sharp, tangy and robust, you should eat the pieces as quickly as possible before they inevitably harden. Keftdedes (22LE) – a Greek meatball starter – was served nice and hot; the perfectly shaped balls of lean meat are mixed with mint and onion, though they did lack a bit of punch. 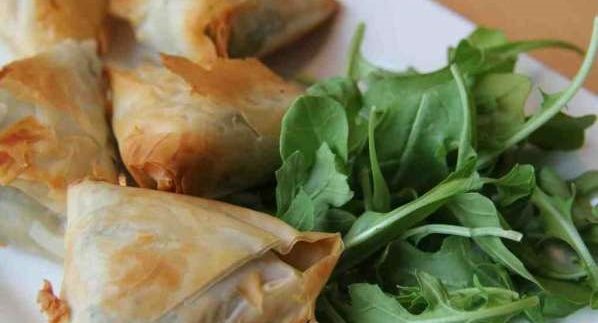 However, the Spanakopitakia (22LE), or filo pastry triangles filled with spinach and feta cheese, was another standout appetiser, being crunchy and fresh on the outside, with a light and earthy filling on the inside. Of the authentic sandwiches, the Beef Gyros (28LE) ticked all the boxes. Shreds of tasty beef lay within a homemade pita along with salad, some French fries and the restaurant’s wonderfully zesty tzatziki dip. What could easily be a very heavy sandwich proved instead to be light and refreshing, in a generous, but still reasonable, portion. The thickly cut homemade fries (10LE), meanwhile, will please all potato-enthusiasts. Not only has the Greek touched on a cuisine that is neglected in Cairo, but the owners’ hands-on approach has developed a very efficient, enthusiastic and informed dining experience, that in turn has fostered a casual and comfortable atmosphere, in a very short space of time. Though the Greek's home delivery service is not yet up-and-running, customers are afforded the option of take-out. Excellent, personable an enthusiastic service. The menu offers one dessert: fried dumplings soaked and showered in honey and cinnamon called loukoumades. But they're not yet available.